Walter SR, Olivier J, Churches T, Grzebieta R. Accident Analysis & Prevention: 2011 Nov;43(6):2064-71. The study aimed to assess the effect of compulsory cycle helmet legislation on cyclist head injuries given the ongoing debate in Australia as to the efficacy of this measure at a population level. We used hospital admissions data from New South Wales, Australia, from a 36 month period centred at the time legislation came into effect. Negative binomial regression of hospital admission counts of head and limb injuries to cyclists were performed to identify differential changes in head and limb injury rates at the time of legislation. Interaction terms were included to allow different trends between injury types and pre- and post-law time periods. To avoid the issue of lack of cyclist exposure data, we assumed equal exposures between head and limb injuries which allowed an arbitrary proxy exposure to be used in the model. As a comparison, analyses were also performed for pedestrian data to identify which of the observed effects were specific to cyclists. In general, the models identified a decreasing trend in injury rates prior to legislation, an increasing trend thereafter and a drop in rates at the time legislation was enacted, all of which were thought to represent background effects in transport safety. Head injury rates decreased significantly more than limb injury rates at the time of legislation among cyclists but not among pedestrians. This additional benefit was attributed to compulsory helmet legislation. Despite numerous data limitations, we identified evidence of a positive effect of compulsory cycle helmet legislation on cyclist head injuries at a population level such that repealing the law cannot be justified. Rissel, 2012 penned a rejoinder to Walther et al that was also published in Accident Analysis & Prevention and subjected to peer review. Rissel found that Walther et al's conclusion (that there was a positive effect of helmet legislation on head injuries) was not warranted because of major shortcomings in their analysis. The non-comparability of the pedestrian and cycling injuries and related lack of consideration of the severity of head injuries. Rissel also criticises the authors for refusing to open up their data for independent scrutiny. According to its authors, this paper ends the debate about the effectiveness of cycle helmet legislation. Lead author, Jake Olivier, claims that this analysis shows that rates of head injuries reduced by almost a third after the New South Wales law was introduced. However, BHRF has identified flaws in the dataset and methods used by Walter et al. The legislation did not lead to material reduction in serious head injuries to cyclists. Significant levels of cycle helmet use appeared first in North America and Australia during the 1980’s. Compulsory helmet use came into force in Australia during 1990 to 1992, with New Zealand following in 1994. There are no other countries in the world with a nation-wide, all-ages cycle helmet law except Finland (a law of dubious standing, as there is no penalty for non-compliance). Laws applying to children exist in a number of states in the US and a few countries in Europe. In Canada, provincial legislation ranges from non-existent to all-ages. Enforcement ranges from non-existent to stringent. Australia was the first jurisdiction in the world to introduce motorcycle helmet laws (in 1961) and seatbelt laws (Victoria, in 1970). In both cases, almost all industrialised countries followed suit within fifteen years. Yet this has not happened with cycle helmet legislation. One reason is that the evidence for the effectiveness of cycle helmets is contradictory. The largest protective effect is reported by case-control studies. These are conducted using emergency room data, comparing the injuries of cyclists who were, or were not, wearing a helmet at the time of their crash. The Cochrane Review of bicycle helmet effectiveness (Thompson, Rivara and Thompson, 2002-9) is composed of seven case-control studies. Two meta-analyses are also composed of case-control studies (Attewell, Glase and McFadden, 2001; Towner et al, 2002). 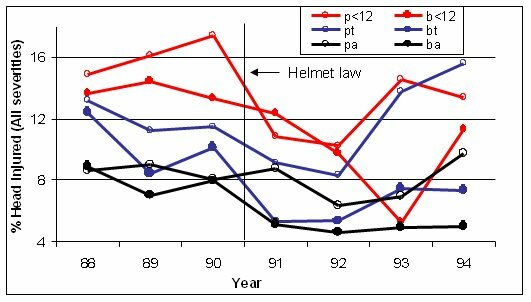 If the case-control studies were correct, then it would be reasonable to expect noticeable reductions in serious head injuries with large and rapid increases in helmet use. Some studies claimed to have identified population-level improvements from helmet use (Povey, Frith and Graham, 1999; Scuffham, Alsop, Cryer and Langley, 2000; Macpherson et al, 2002). 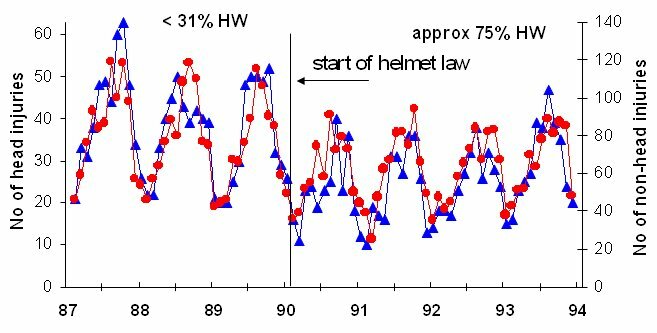 However, when the same datasets were re-analysed to include the effects of secular injury trends, there was no noticeable improvement evident related to growing helmet use (Robinson, 2003; Robinson, 2006). The claimed benefits of helmet laws in Canada have also been retracted (Middaugh-Bonney et al, 2010). Further doubt was cast on case-control type evidence in a literature review for the British Department for Transport (Hynd, Cuerden, Reid and Adams, 2009). The authors could not reach any conclusion from medical evidence regarding the effectiveness of helmets, and had to write their conclusions in the subjunctive mood (“helmets would be expected to be effective…”). Case-control studies have recently been re-analysed to take account of publication bias, time trends bias and zero count bias (Elvik, 2011). This study also investigated head, facial and neck injuries together to evaluate the net benefit. It concluded that in older case-control studies, there was still a net benefit, but in newer studies the net benefit was nil, because increased facial and neck injuries matched head injury reduction. Social effect is an important confounding factor for case-control studies. National surveys of helmet wearing show that voluntary helmet use is positively correlated with income and educational attainment. This has been observed in Canada (Dennis, Potter, Ramsay and Zarychanski, 2010) Ireland () and Britain (Sharratt, Walter and Anjurn, 2009). It is also known that risk of head injury is negatively correlated with income and educational attainment, especially amongst children (Edwards et al, 2008): case-control studies have been dominated by child injuries. Hence it is apparent that selective recruitment will be a confounding factor in case-control studies. The most recent contribution to the literature is a study of cycle helmet legislation in New South Wales, Australia (Walter, Olivier, Churches and Grzebieta, 2011). It is based on a dataset of 36 months of cyclist and pedestrian injuries evenly spread before and after the dates when the state helmet law came into effect, in January (adults) and June (children) 1991. The study concludes: “… we have identified evidence of a positive effect of compulsory cycle helmet legislation on cyclist head injuries at the population level such that repealing the law cannot be justified”. Overall road safety trends were accounted for by using pedestrians as controls. Australia has no national travel survey, so data on amounts of walking and cycling were lacking. The study therefore analysed the ratios of head injuries to arm and leg injuries, on the reasonable basis that exposure would be equal for different body parts. The approach taken was, in principle, robust, but the re-analysis below suggests otherwise. No analysis can be better than its dataset. In this case, the selection of injury codes did not allow like for like comparison of pedestrian and cyclist injuries. Pedestrian falls do not appear under “transport accidents”, but are classed under “other causes of injury”. So when comparing pedestrian and cyclist injuries, researchers must separate cyclist falls from the data. Or else, they must acquire data for pedestrian “falls in highway” and “falls in unspecified location” from the “other causes of injury”. Confusion over this point is a common cause of error in the literature. In one study of seasonal injuries (Gill and Goldacre, 2009), the authors reached incorrect conclusions due to being unaware of this point. In a European policy document (), the statement is made that 45% of transport injuries in the Netherlands are cyclists. This is likewise an invalid claim, based on the same confusion (12% is a more representative figure). Walter et al state that 82% of the cycling accidents in the dataset were falls, and only 17% were traffic related. 60% were children under 16. This means that the study is mostly a comparison of child cyclists injured falling off their bikes with pedestrians (all ages) struck by motor vehicles. Injuries inflicted by motor vehicles are considerably more serious than injuries in falls. Hence the authors did not compare like with like. When like has been compared with like (e.g. Robinson, 1996) other important information becomes apparent. Figure 1 below shows the percentages with head injury for cyclists and pedestrians receiving no-fault compensation for treatment of injuries arising from collisions with motor vehicles. The risk of head injury decreases with age, but the trends for cyclists and pedestrians are similar. from collisions with motor vehicles by age group (Children <12, t=teenagers 13-17 years, a – adults, from Robinson, 1996). In Victoria, surveys show that the reduction in teenage cycling (48%) was much greater than the decline in adult cycling (29%, Robinson, 1996) and the same appears to be true in NSW. Given that age (or age group) has a considerable influence on the risk of head injury, this should have been accounted for in the analysis of Walter et al. A disproportionate reduction in the amount of children’s cycling is expected to result in a reduction in the percentages with head injury, which, in the analysis of Walter et al. would be misinterpreted as an effect of the law. Another curious factor in the model of Walter et al. is the way time trends were fitted. Time trends are evident in Figure 1, with the data for both pedestrians and cyclists showing similar trends over time. There is no reason to assume that, if the helmet law for children had been introduced a year later (in 1992 instead of 1991) that the time trend for children would be identical to that for adults a year earlier. Yet this is the implication of the model of Walter et al. – the time trend for children is assumed to be identical to that for adults, but after a 6 month delay, because the law was introduced 6 months later. Walter et al. do not discuss why this model was considered appropriate, or even valid. NOTE: Walter et al. list codes E810-E825 5th character “3” as part of the dataset (Table 1). In the ICD-9 system, pedestrians are actually listed under 5th character “7”. Although this is may be a typographical error in the manuscript, the authors should have checked their original data acquisition. It would be unfortunate if they had compared cyclists with motorcycle pillion riders. The aforementioned error is compounded by the scope of head injuries in the Walter et al study. This includes all severities of head injury, including scalp wounds and bruising. It is not stated what proportion of the head injuries were of lesser severity. From other cycle helmet research, is has been observed that very few cyclist head injuries are severe (almost 90% of the head injuries in Thompson, Rivara and Thompson, 1989 are AIS 1 or 2). Hence the authors’ conclusion, of having found a population level effect due to legislation, is less significant than it may appear. At best, they have shown what is already known – that cycle helmets may prevent some scalp wounds. 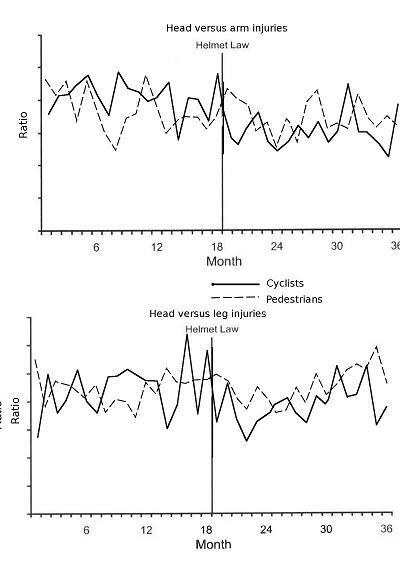 Walter et al developed a statistical model and conclude a 25% to 29% reduction in head injuries to cyclists (relative to pedestrians) when the helmet legislation came into effect, but they do not explain how the figures were derived. Figure 2, below, superimposes the charts in Figure 4 of Walter et al. showing that the trends do not actually exhibit such an improvement for cyclists. The data are fairly “noisy”. There is no sustained, credible step reduction for cyclists at the time of the law in either case. More importantly, by focussing only on the ratio of head to arm or leg injuries, other important aspects of the data could be masked. Numbers of head and non-head injuries, reported by Carr, Dyte and Cameron, 1995 and Robinson, 2005 are shown in Figure 3. The authors claim adult cycling increased in NSW after the helmet law and overall cycling levels were unaffected. They acknowledge a fall in child cycling but do not quantify it. They have not discussed the disparity between their claims and other evidence that adult cycling fell post-law. The sample size of the study was small, just over 2000 injuries in total but the exact number is not made clear. The absence of absolute numbers in the paper is striking. Could the statistical findings be chance when based on such a small dataset? It's also not clear how severe the injuries were. Was brain injury being prevented or just a few less scalps to stitch up? Suspicion is aroused by the differing injury trends after the law. Why did arm and head injury trends start increasing, but pedestrian leg injuries not increase?. One would expect arm and leg injury trends to be similar with a comprehensive dataset. The head/leg injury ratio is the same 18 months before and 18 months after the law. Any 'effect' from the helmet law is lost and seems temporary. For Head/arm injuries the ratio is narrowing and we are not told what happens in the following few years though the data for this must exist. The head injury rate also seems to have climbed back, almost up to the pre law trend line, 18 months after falling following the law. The final paragraph is not in keeping with the modest and more careful language otherwise used and the previous qualifications made about the data quality. It claims the study finds evidence so strong the law should not be repealed. This is not justifiable, the evidence from this study does not allow such a black and white judgement. It may be considered interesting and noteworthy, but no single piece of research of this nature is a basis for policy making. How independent was the study and how open-minded were the researchers at the outset? Funding came from the New South Wales Government which passed the helmet legislation. Did it want the truth or was it more interested in countering the Rissel and Wen, 2011 and de Jong, 2009 studies that have increased pressure for reconsidering the law? The researchers have made some very sweeping statements in the media based on this study. As with previous studies supportive of helmet use and legislation, this study provides no evidence to quantify the risk of head injury when cycling or to show that the supported remedy is proportionate to the risk. Walter et al. failed to make their case that helmet legislation achieved a population level effect in New South Wales, Australia. The dataset is unsound. Lesser severity cyclist head injuries, mostly in falls, were compared with high severity pedestrian head injuries in road traffic accidents. In addition, the definition of head injury was broad, including low severity injuries such as scalp wounds and bruising. Despite this, the comparison of pedestrian and cyclist injury ratios does not show a noticeable, sustained improvement for cyclists after the legislation came into force. This adds to previous studies that claimed an effect from helmet legislation, yet upon re-evaluation of the data, a null result was concluded. Robinson, 1996 compared numbers of injuries to child cyclists with the amount of cycling. This is a much more meaningful representation, because it approximates the real risk, rather than a function that declines with the amount of cycling. Observational surveys showed that children's cycling declined by 36% and 44% in the first and second years of the law, but head hospital admissions for child cyclists with head injury declined by only 29%. This represents real increases in the risk of head injury for child cyclists of 11% in the first year and 27% in year 2. By ignoring the amount of cycling, as well as the lost health and environmental benefits of cycling, the conclusions of Walter et al. are both incorrect and misleading. de Jong P, 2009. Evaluating the health benefit of bicycle helmet laws. Macquarie University NSW . Dennis J, Potter B, Ramsay T, Zarychanski R, 2010. The effects of provincial bicycle helmet legislation on helmet use and bicycle ridership in Canada. Injury Prevention 2010;16:219-24. Elvik R, 2011. Publication bias and time-trend bias in meta-analysis of bicycle helmet efficacy: A re-analysis of Attewell, Glase and McFadden, 2001. Accident Analysis & Prevention 2011;43(3):1245-1251. Gill M, Goldacre M, 2009. Seasonal variation in hospital admission for road traffic injuries in England: analysis of hospital statistics. Injury Prevention 2009;15:374-78. Middaugh-Bonney T, Pike I, Brussoni M, Piedt S, Macpherson A, 2010. Bicycle-related head injury rate in Canada over the past 10 years. Injury Prevention 2010;16:A228. Rissel C, 2012. The impact of compulsory cycle helmet legislation on cyclist head injuries in New South Wales, Australia: A rejoinder. Accident Analysis & Prevention 2012;45:107-109. Walter SR, Olivier J, Churches T, Grzebieta R., 2011. The impact of compulsory cycle helmet legislation on cyclist head injuries in New South Wales. Accident Analysis & Prevention 2011 Nov;43(6):2064-71.